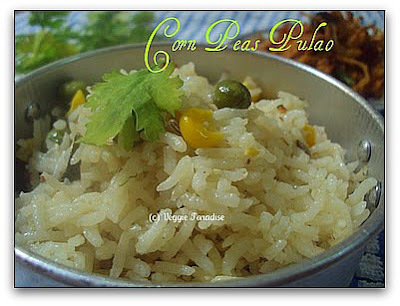 This is an easy pulav with corn and peas. I added Almond - cashew powder to this pulao ,and this gave a richer taste to this rice. Usually raita's are served as side dish for any pulav's but we had with crispy onion cabbage pakoda's and it was great.. I am too lazy to prepare coconut milk and hence I went along with milk. (You can add coconut milk). 2 nos. cardamom and cloves. Wash and chop the onions, split the green chillies lengthwise. Wash and clean the rice , keep it aside. In the cooker, add little ghee and oil, add all the seasoning ingredients. Add the green chillies sauté for a min,add the chopped onions and saute them until they turn translucent. Add the ginger- garlic paste , sauté them well. Add the peas and corn, along with the grinded powder and sauté for 2 min's. Add the rice sauté for a min, add one cup of milk along with 2 cups of water and salt,allow it for 2 whistles. (cook in medium flame). Simple and delicious pulao ..really good and hope it taste rich adding almond and cashew powder right..
Aruna, this looks delicious. Very beautiful! Pulao looks super delicious, adding almond and cashew would have turned out this pulao more tasty and rich..beautiful pulao.. Simple & yummy pulao.. looks nice..
adding almond cashew powder is new,sometimes we used to add cashew paste with coconut ilk.looks yummy. This pulao looks rich nad tasty I like theaddition of nuts,adding milk to rice is new to me but may be I will give it atry. 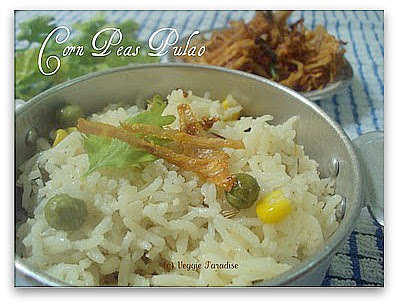 Corn and peas pulao looks really good. luv the aniseed n cashew almond paste...guess it must hv tasted heavenly rich. Lovely picture, it looks so aromatic and tempting. Simple and Tasty pulao. Adding Cashew Powder is new. Lovely pulao. Addition of nuts have made this pulao rich and yumm! This is rich! Lovely recipe! this looks delicious. Very beautiful! One of my fav combo. Looks yummy. 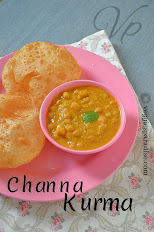 Its a lovely and yummy recipe. I like all sorts of puloa with coconut milk. Beautiful pulao, looks absolutely delicious.